I have recently come across Conceptual Mathematics: A First Introduction to Categories by Lawvere & Schanuel. It is a gentle introduction to Category Theory and strikes me as a potential alternative text for a bridging course to abstract mathematics. Has anyone here used it as such and what were the pros and cons you experienced in doing so? Related: Where can I find resources for creating a mathematics “bridge course”? Edit: Another text I've encountered is David Spivak's Category Theory for Scientists. It is also a gentle introduction to Category Theory, but with an emphasis on modeling scientific ideas. I find Conceptual Mathematics creative, illuminating, and thought-provoking. Subobject classifiers for high school students! However, I've never taught from it and I don't think it's well-suited to the goals of a typical bridging course. Do you use "Let x" to begin a proof of $\forall x$ or $\exists x$? If you want to prove $P\rightarrow Q$, does it make sense to investigate $P\ \&\ \neg Q$ or $Q\ \&\ \neg P$? What is the difference between $\forall x\exists y$ and $\exists y\forall x$? The students in Lawvere and Schanuel's dialogues remind me of the students in Proofs And Refutations, by Imre Lakatos -- nominally naive, actually not likely to be tripped up by any of the above questions -- and therefore more mathematically sophisticated than most students that would be taking a bridging course. I'd stick with the suggestions from the other question. My instinctive reaction is that a "category error" is being made here (in the philosophical sense, not the mathematical sense of category). Namely, category theory is an abstraction of (standard, undergraduate level) abstract algebra, which is itself an abstraction of the sort of very concrete mathematical manipulations most students have seen up to that point. 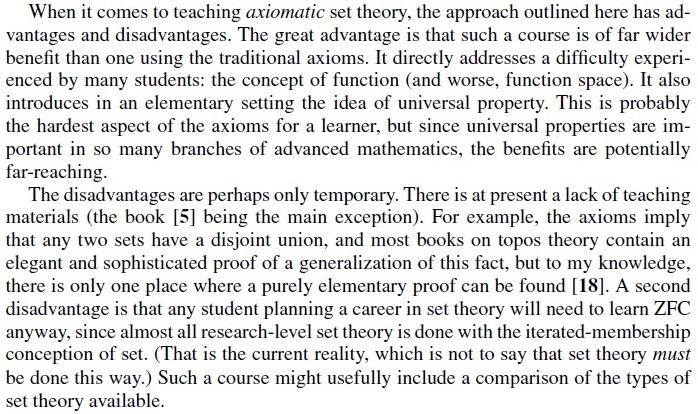 In most undergraduate curricula I am familiar with, the sort of transition course you describe comes just before abstract algebra and gives students needed familiarity with (i) reading and writing proofs, (ii) very basic mathematical logic, and (iii) experience with the next level of abstraction in mathematics (i.e., rather arbitrary sets, functions and relations). I have taught the above bridge course twice at the University of Georgia. Admittedly there is a class of undergraduates who do not take this course, so it is somehow the opposite of an honors course. Nevertheless I think the students there are representative of the sort of math majors one meets in many American universities. In this course I spend more than two weeks on mathematical induction, and the abstraction of induction as a statement about subsets of the natural numbers is very challenging for the students. Proving things like: if $f: X \rightarrow Y$ and $g: Y \rightarrow Z$ are functions, then: if $g \circ f$ is injective, $f$ is injective; if $g \circ f$ is surjective, $g$ is surjective; $g \circ f$ surjective need not imply $f$ surjective, and so forth -- is something that my students can learn eventually but certainly need to be taught. Each time I taught the course I ended up doing very little with cardinalities of infinite sets: this material occurs at the very end of the syllabus, and by the time I got there I felt it would be more worthwhile for the majority of the students if I spent the last part of the course reinforcing the basic techniques learned, rather than tacking on a new concept that (unfortunately, to be sure) does not get used much in the rest of their undergraduate career. I should admit that I do not own the book of Lawvere and Schanuel. I looked at some of it on amazon just now, and it does look to be quite carefully written and unusually friendly. At a preliminary glance it looks plausible and even intriguing to use this text for some other undergraduate course. However, to use it for a transitions course would involve increasing the level of abstraction in such a course and therefore seems to be less appropriate for (at least the standard versions of) that course than for other courses. Using this text would involve abandoning most of the traditional content of a transitions course and, for the clientele to which the traditional content is pitched, that would be a loss. I don't want to be too discouraging though: a sufficiently talented, knowledgeable and enthusiastic instructor can make almost anything work. In fact my first undergraduate introduction to abstract algebra began with five weeks of category theory. Before we learned about groups, we learned about monoids and the free monoid functor (called the "James construction": I have not gone back to try to track down its provenance). Before we studied monoids we studied sets and mapping from the perspective of universal mapping properties, e.g. we learned the Quotient Principle for when one map factors through another (in the category of sets). The latter at least turned out to be extremely useful. Overall the course at the time looked eccentric, and doing something more traditional would probably have worked even better, but it did work, because the instructor -- the still-present, great Arunas Liulevicius -- had so much insight, enthusiasm and charm. It also worked because the students were very talented and enthusiastic: this was the "honors algebra course" at the University of Chicago. So you can make things work that sound like they shouldn't, sometimes. Leinster, T. Rethinking Set Theory. The American Mathematical Monthly, 121(5), pp. 403-415. An arXiv version can be found here. Mathematicians manipulate sets with confidence almost every day, rarely making mistakes. Few of us, however, could accurately quote what are often referred to as 'the' axioms of set theory. This suggests that we all carry around with us, perhaps subconsciously, a reliable body of operating principles for manipulating sets. What if we were to take some of those principles and adopt them as our axioms instead? The message of this article is that this can be done, in a simple, practical way (due to Lawvere). The resulting axioms are ten thoroughly mundane statements about sets. Leinster makes it a point to dispel a few misconceptions about Lawvere's presentation, namely, (1) that an underlying goal is to replace set theory with category theory; (2) that the axiomatization requires greater mathematical maturity than other systems (e.g., ZFC); and (3) that there might be some inherent circularity by mentioning both 'categories' and 'sets'. (5) F. W. Lawvere, R. Rosebrugh, Sets for Mathematics. Cambridge University Press, Cambridge, 2003. (18) T. Trimble, ETCS: building joins and coproducts (2008). Retrieved online from http://ncatlab.org/nlab/show/Trimble+on+ETCS+III. Not the answer you're looking for? Browse other questions tagged undergraduate-education course-design textbooks category-theory or ask your own question. How do you go about writing your own lecture notes for a new course? Functional analysis text for junior-senior math majors? What reasons are there preventing me from using an old edition text?